Mount Dora, Fla. – Speeding in work zones risks the safety of the public and work crews. 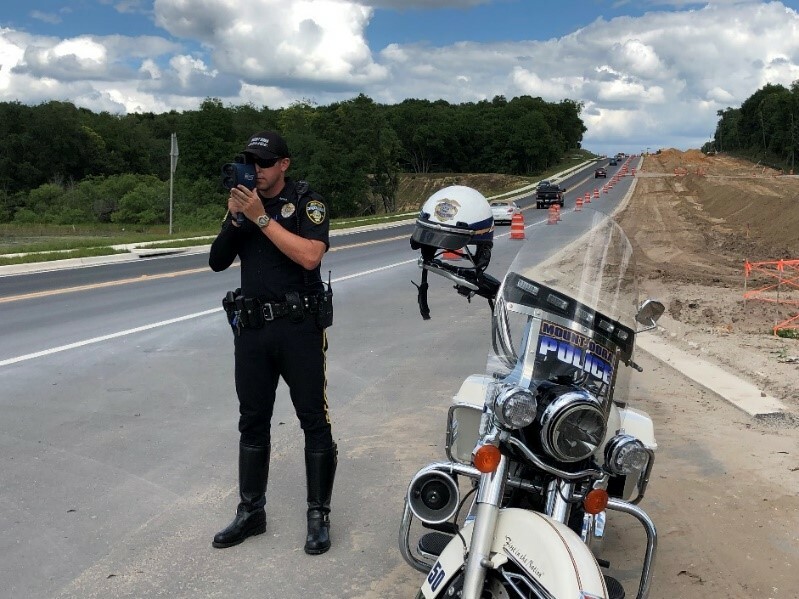 So, the Mount Dora Department is conducting traffic enforcement as part of the Wekiva Parkway project on State Road (S.R.) 46 between Round Lake Road and U.S. 441 to enhance safety along the corridor. Police for several weeks are using radar to enforce the posted 45 mph speed limit, and will continue to do so. Enforcement efforts began Monday, Apr. 8, to increase safety for crews in the work zone and to ensure the safety for the people who live and travel through the area. Since that time, officers have conducted 39 traffic stops and issued 12 citations. Fines for moving violations committed within work zones are often higher. Leave early when planning to drive through a construction zone as lane closures or other construction events may be occurring. Pay attention to all posted signs and message boards as they could contain critical information that could impact your travel. When work is long-term, such as on the Wekiva Parkway, multiple traffic shifts could occur, so it’s important to remain vigilant about changing traffic patterns and road conditions. Speed limits may be lowered while construction is ongoing, so follow posted signs instead of the speed limit advised by your navigation program. Sorrento, Fla. - Crews are scheduled at night Thursday, Apr. 18, to close westbound State Road (S.R.) 46 from Old McDonald Road to State Road (S.R.) 429. Traffic in both directions will alternate through one lane from 8 p.m. to 6:30 a.m. to allow crews to work on barrier wall. Sanford, Fla. – Crews are scheduled at night on March 18-19 to close the eastbound lane of State Road (S.R.) 46 from Center Road to Wayside Drive as part of building the Wekiva Parkway (S.R. 429). Traffic in both directions will alternate through one lane from 9 p.m. to 5 a.m. to allow crews to perform stormwater drainage operations on the outside shoulder of S.R. 46. Additionally, crews are scheduled at night on March 18-19 to intermittently close Orange Boulevard between Wayside Drive and Walden View Drive to walk a crane across the roadway. Off-duty law enforcement officers will assist in directing traffic during the brief road closure. Electronic message boards have been posted. Motorists may experience a slight delay during this operation. Please be advised that weather or other unexpected conditions could delay or prolong work. Sanford, Fla. – Crews are scheduled at night on March 18-21 to close eastbound State Road (S.R.) 46 from the Wekiva River to River Oaks Circle as part of building the Wekiva Parkway (S.R. 429). Traffic in both directions will alternate through one lane from 8 p.m. – 6 a.m. to allow crews to set beams on the new service road bridge. Additionally, the right turn lane from eastbound S.R. 46 to River Oaks Circle will be closed. Flaggers will direct traffic in and out of the Wekiva River Oaks community. Motorists may experience a slight delay during this operation. Electronic message boards have been posted. Please be advised that weather or other unexpected conditions could delay or prolong work. This work is part of Wekiva Parkway Section 6, which began construction on October 17, 2017. The 6-mile stretch of largely elevated expressway will extend along the S.R. 46 corridor from the S.R. 429 interchange east of Camp Challenge Road to just west of Longwood-Markham Road. Mount Dora, Fla. - Crews are scheduled on Monday, March 11, to close Pinecrest Road at State Road (S.R.) 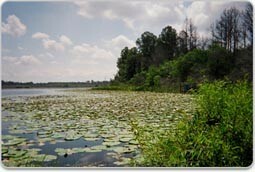 46 for approximately two months as part of building the Wekiva Parkway (S.R. 429). The temporary closure will allow crews to widen the westbound lanes of S.R. 46 west of U.S. 441. Access to Pinecrest Road from S.R. 46 will be via the adjacent side street, Groveland Road. Mount Dora, Fla. - Crews are scheduled beginning on March 11 to close Natoma Boulevard at U.S. 441 for approximately two months as part of building the Wekiva Parkway (State Road (S.R.) 429). The closure will allow the contractor, GLF Construction, to widen the northbound lanes of U.S. 441 and build the connection to Natoma Boulevard. During this operation, traffic will be detoured to the S.R. 46 and Sabastian Street entrance to the Summerbrooke community. Electronic message boards and detour signs have been posted alerting drivers to this closure. Please note this schedule may change due to weather or other unexpected conditions. The work is part of Wekiva Parkway Sections 3A and 3B, which began construction on October 30, 2017. The non-tolled improvements include widening S.R. 46 to six lanes from U.S. 441 to Round Lake Road, and building a flyover bridge at U.S. 441. Work includes widening U.S. 441 to six lanes in the area, and installing sidewalks and other pedestrian facilities. The non-tolled improvements are being made in anticipation of the heavy traffic expected to head to the parkway. Construction is scheduled to finish in spring of 2020. SANFORD _ Crews are scheduled nightly March 3-4 to remove and replace the traffic signal on State Road (S.R.) 46 at Longwood-Markham Road as part of building the Wekiva Parkway (S.R. 429). The work, scheduled from 8 p.m. - 6 a.m., will allow crews to deactivate the existing signal and install a temporary one. Law enforcement will direct traffic at the intersection during this operation. Please note this schedule may change due to weather or other unexpected conditions. Project engineers will monitor the new, temporary traffic signal and are prepared to make additional adjustments based on traffic patterns, if necessary. SANFORD _ Crews are scheduled February 21-22 to intermittently conduct single lane closures on North Orange Avenue and North Center Road just north of State Road (S.R.) 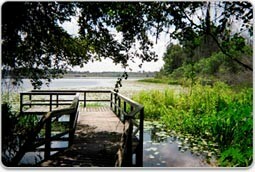 46 as part of building the Wekiva Parkway (S.R. 429). The lane closures, scheduled from 8 a.m. - 4 p.m. daily, will allow crews to install utility pipe. Flaggers will assist in directing traffic. Please note this schedule may change due to weather or other unexpected conditions.